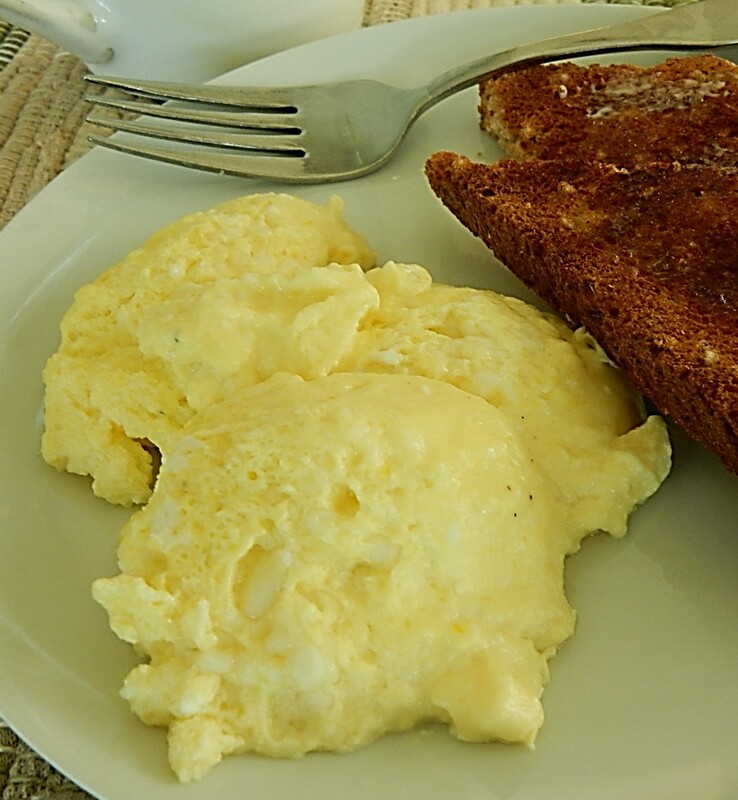 Scrambled eggs are always good, but sometimes when I make them for the fourth time in less than a month, they begin to seem boring – so I was thrilled to find a hundred-year-old recipe with a “new” twist and an intriguing name to boot. Southern Golden Fleece is made with cream cheese and eggs, and is silky and rich. It surprised me that Southern Golden Fleece is made using just one dish, and cooked in the oven. Apparently the recipe author did not want to end up with a stack of dirty dishes. Preheat oven to 375° F. Put cream cheese and cream in a large casserole dish. (A 2-quart dish works well and leaves lots of space for stirring and beating). Place in oven for about 5 minutes or until the cream cheese is soft; remove from oven and blend using a fork. Break the eggs on top of the cheese mixture, and stir until combined. Sprinkle with salt and cayenne pepper. Put lid on dish and return to the oven. Bake until the egg whites begin to set (5-8 minutes); then beat for 2 minutes. Cover and return to oven and cook until the eggs are set (3-5 additional minutes). Remove from oven, and put in serving dish. Serve immediately. Food for week-end breakfasts and brunches should be special – yet I also want convenience. I found a hundred-year-old recipe that fits the bill. Spanish Scrambled eggs are colorful, tasty, and easy to make. 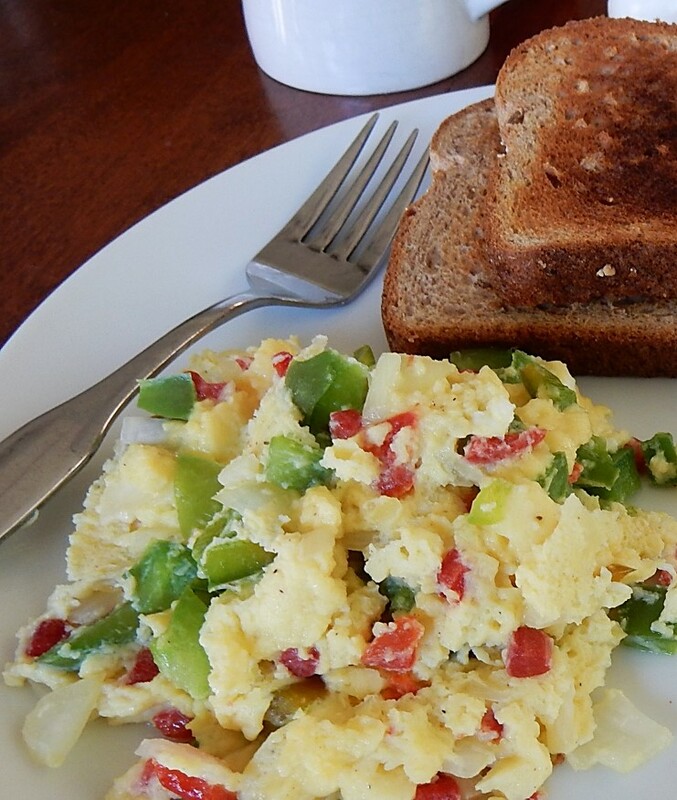 These savory scrambled eggs have flecks of green pepper, pimento, and onion that delight both the eye and the taste buds. This recipe is a keeper. Whisk the eggs together in a bowl, then stir in the milk, salt, and pepper. Set aside. In the meantime, melt the butter in a skillet, add the onion and green pepper and saute until tender. Add the egg mixture and the pimento. As the mixture begins to thicken, use a spatula to lift and fold the curds. Continue cooking and folding until no liquid remains. Remove from heat. If desired, may be served with toast. Cook’s note: The old recipe called for 1 teaspoon salt. This seemed excessive to me, so I reduced it to 1/2 teaspoon when I updated the recipe. 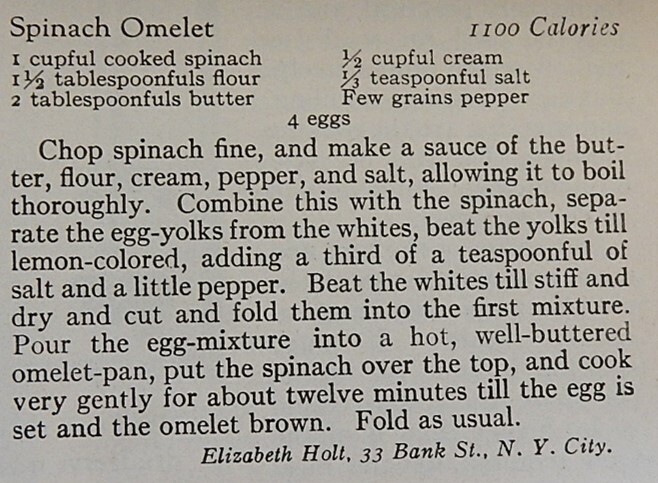 I recently saw a hundred-year-old recipe for Spinach Omelet, and decided to give it a try. A homemade omelet makes breakfast special. 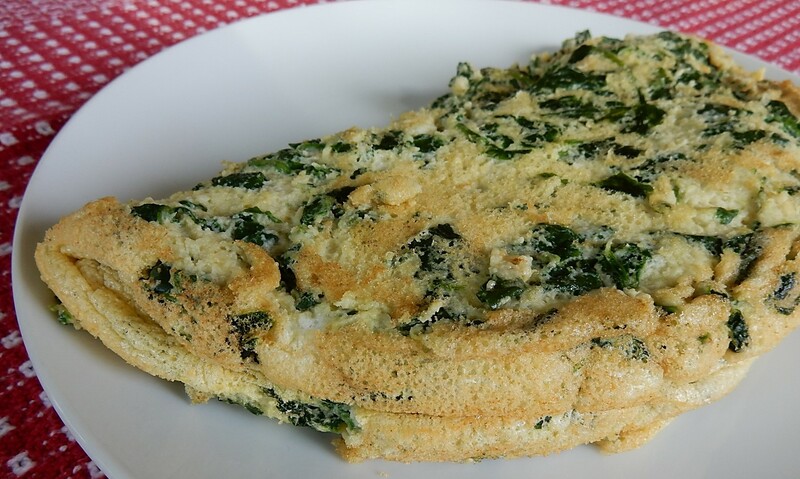 Often omelets are a little greasy and heavy, but Spinach Omelet is light and fluffy. The recipe calls for beating egg whites into stiff peaks, and then folding the remainder of the ingredients into them. This omelet has a delicate spinach flavor – and is less savory than the typical modern omelet that also contains onions, bacon, or cheese – but is delightful. If using fresh spinach, rinse the spinach and put into a sauce pan. Do not add any additional water; the water clinging to the spinach leaves will be enough. Using medium heat, cook until the spinach is wilted (approximately 5 minutes). Remove from heat. Cool slightly, then coarsely chop cooked spinach; set aside. Using medium-low heat, melt the butter in a sauce pan; then stir in the flour, salt, and pepper. While continuing to stir constantly, slowly add the cream. Increase heat to medium, and stir until the sauce thickens. Remove from heat. Beat egg yolks, then quickly stir into the white sauce. Add cooked spinach, and stir to combine. In a separate bowl, beat egg whites until stiff peaks form. (Be sure that the beaters are clean and dry – otherwise the egg whites might not stiffen and form peaks.) Gently fold the egg whites into the egg yolk mixture. Then cook omelet either on the stove top or in the oven. Stove top method: Pour into a prepared omelet pan. (If needed grease to prevent sticking.) Cover and cook using low heat for about 12 minutes or until the is set. 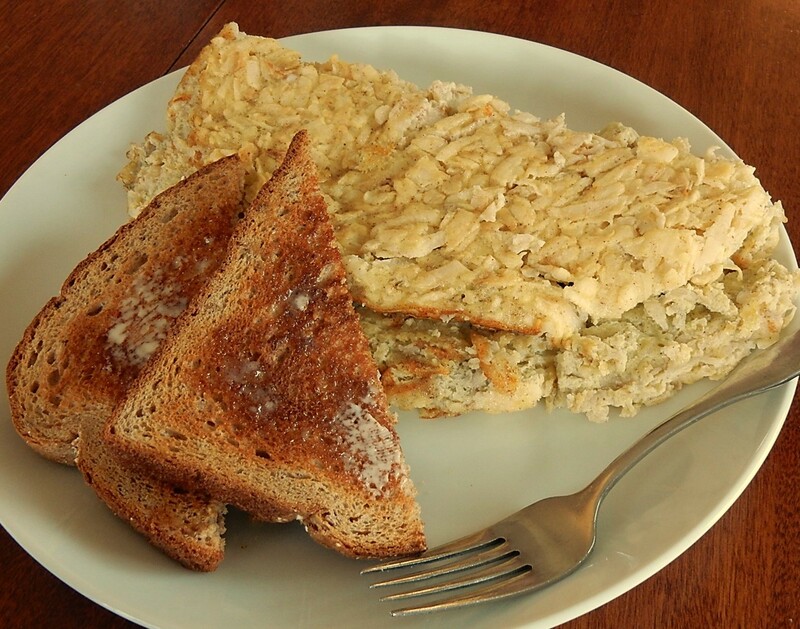 Fold omelet, and slip onto a plate. Serve immediately. Oven method: Pre-heat oven to 350° F. Heat a large oven-proof skillet on the top of the stove using medium-low heat. (If needed to prevent sticking, liberally grease the skillet before heating.) Pour the egg and spinach mixture into the hot skillet, and gently cook for 1 minute. Move the skillet to the oven, and bake for about 12 minutes or until the egg mixture is set. Remove from oven, and loosen the edges of the omelet from the skillet with a knife or spatula, then turn onto a plate; fold into half. Serve immediately. There are lots of things I like about Easter, but using all those hard-boiled eggs lurking in my refrigerator can be a challenge. So I was pleased to find a hundred-year-old recipe for Egg Sauce. It was easy to make, and is delightful when served on asparagus or other green vegetables. The Egg Sauce recipe called for one pint (2 cups) of Cream Sauce. The Cream Sauce recipe made approximately one cup of sauce. To make the two recipes compatible I halved the Egg Sauce recipe. Melt the butter in a saucepan using low heat, stir in the flour. Increase the heat to medium; gradually add the milk while stirring constantly. Continue stirring until hot and bubbly. Add salt, pepper, and chopped eggs. Stir to combine, continue heating until the sauce again begins to bubble. Remove from heat and serve immediately. 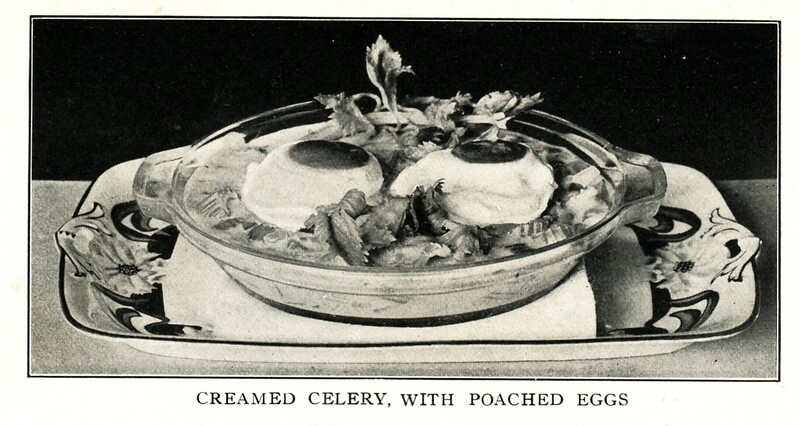 When I saw a delightful picture illustrating a Creamed Celery with Poached Eggs recipe in a hundred-year-old magazine, I knew that I needed to give it a try. The recipe did not disappoint. 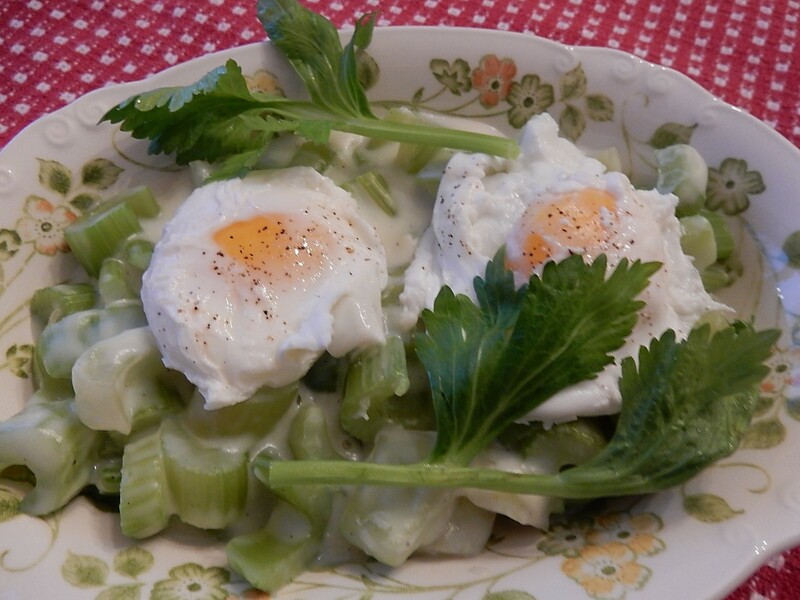 My rendition of Creamed Celery with Poached Eggs was lovely. The presentation was just a tad dramatic, and it turned an ordinary meal into a special one. This vegetable and egg dish is perfect for breakfast . . . or lunch. 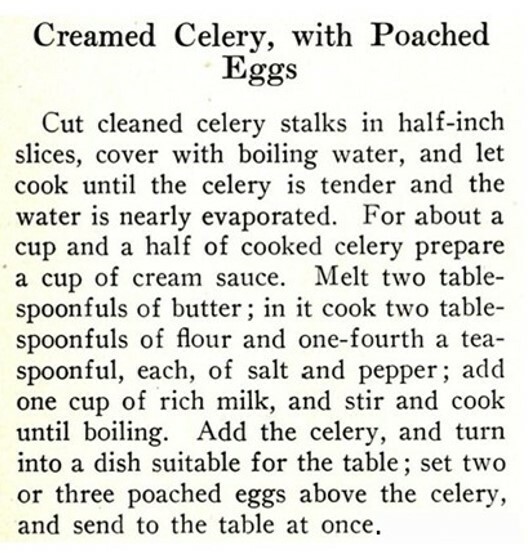 The slight tang and bite of the celery combines with the cream sauce and eggs to create lovely taste sensation. Put the celery in a medium sauce pan. Cover with water and bring to a boil using high heat; then reduce heat and simmer until tender (about 10 minutes). Drain well. In another pan, using medium heat, melt butter; then stir in the flour, salt, and pepper. Gradually add the milk while stirring constantly. Continue stirring until the white sauce thickens. Gently stir in the cooked celery, and remove from heat. In the meantime, bring 1 1/2 to 2 inches of water to a boil in a skillet, then reduce to a simmer. Break each egg into a small bowl or cup, then slip into the water. Cook for 5 minutes. Remove the poached eggs from the water using a slotted spatula, and drain on paper towels. Sprinkle with salt and pepper. To assemble the dish: Put the creamed celery in the serving dish, then gently place the poached eggs on top of the celery. If desired, garnish with celery leaves.